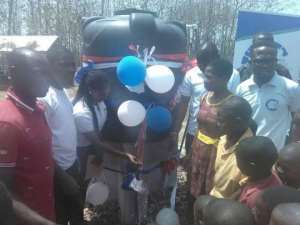 Global Shapers Community, a Non-Governmental Organization based in Ho has commissioned a mechanized borehole for the Adaklu Kpogadzi Salvation Army Basic School. The 10,000 dollar project will also serve Kpodzi and other surrounding communities in the catchment area. Mr. Tsunam Akpeloo, Founding Curator, Global Shapers Community Ho, said the Organization's attention was drawn to the plight of students in the school, who had to travel long distances to fetch water for daily use. He said the only source of water for the communities was ponds, with frequent cases of diarrhea related diseases leading to high incidence of absenteeism. Mr. Akpeloo said the Organization initially provided the school with water purifiers but realized it wasn't enough due to the increasing population of the school. He said the Organization was working with other international agencies to provide ICT equipment to the school. Mr. Prosper Shittie, Assistant Head Master, Kpogadzi Salvation Army Basic School, expressed gratitude to the Organization and assured that the facility would be put to good use. The Parent, Teacher Association of the school was tasked to manage the facility.